Twin explosions rocked a football viewing centre in Ajilari ward, Jere Council area of Maiduguri, in Borno State today March 1st killing several football fans, Vanguard reports. 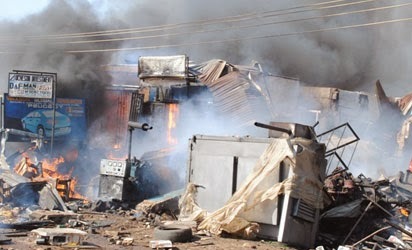 The Improvised Explosive Devices (IED), said to have been planted by suspected Boko Haram terrorists at the viewing centre at Ajilari Railway Cross, exploded at about 6pm, killing many fans, while several others sustained injuries. A residents of Ajilari told a Vanguard correspondent that, “Some suspected terrorists in two Toyota Hilux Pick Up vans, pretending to be firewood suppliers, detonated the bombs near the football viewing centre, resulting in loss of several lives.